Seriously, is there a better site? I LOVE, LOVE, LOVE pizza. I have been making it for a long time and I never get tired of it. People think that it is difficult to make but it’s not. The most difficult thing is trying not to eat it until it’s all gone. 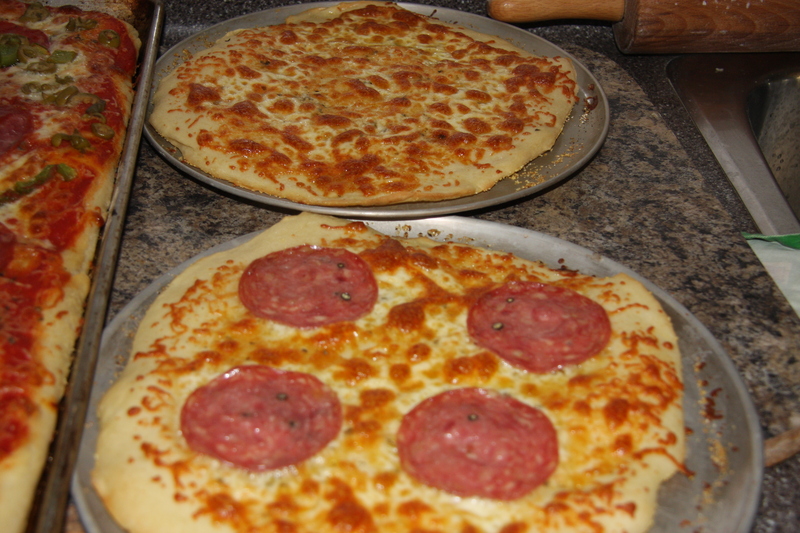 When I make pizza I always make more so that we have it for 2-3 days. It keeps well and is easy to reheat. It makes the house smell out of this world and people will think you went to all of this trouble and fussed. Well, I’m about to give away my secret on how simple this process is. Many years ago I made up my own recipe, which is also easy and really good. Though a few years ago I decided to try my hand at baking bread and discovered another recipe which I absolutely love. The main reason is that once you make it you can store it in the fridge for up to 10 days. 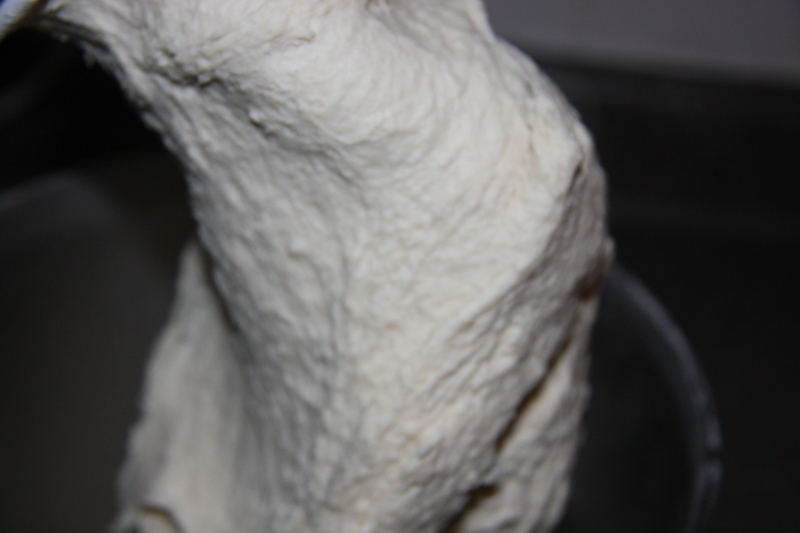 So, if you know your going to need some bread dough make it ahead of time and on the day, you just bring it to room temperature, shape and bake. This recipe is from Artisan Bread In 5 Minutes A Day. 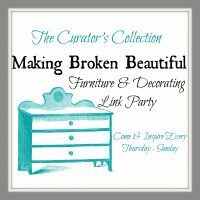 It is fantastic and super simple. I use it in a variety of ways. I even steam it for a dish called Knedle. So, so good. Anyway, here’s the recipe. I hope you do try it. If you like you can cut this recipe in half. First you measure 6 cups of unbleached flour and I have used all purpose flour and it works well also. 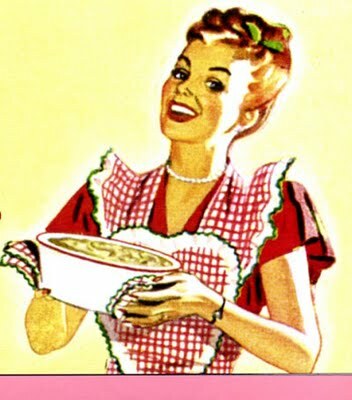 Place the flour into a mixing bowl. I like to use my Kitchen Aid Mixer. Add 2 tablespoons of dry yeast, along with 1 tablespoon of kosher salt. Mix with the paddle attachment until well blended. 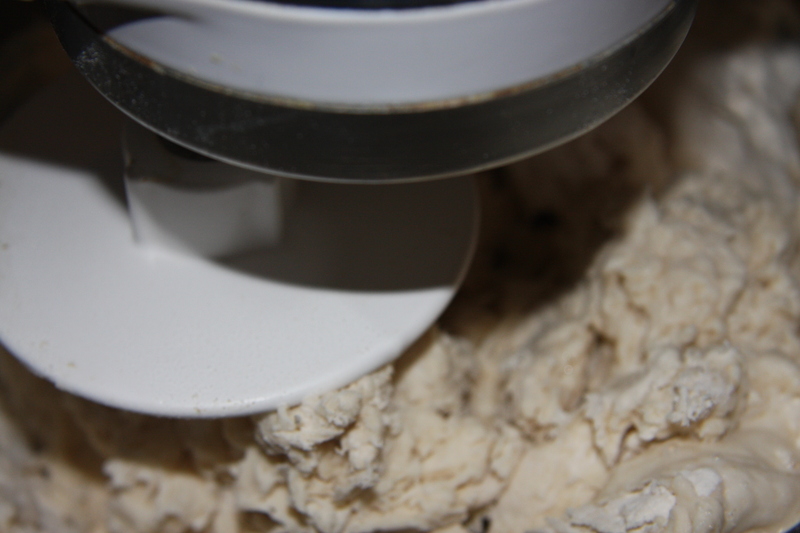 Switch to the dough hook for the mixer because you will be using it from now on. Add 2 cups of warm water and start to mix. When it starts to come together slowly add in another cup of water. You may not need it completely, especially if using all purpose flour. It will slowly come together. And it will start to pull away from the bowl. At this stage I differ from the original recipe. I crank up the speed on the mixer and knead the dough for about 5 minutes. Notice there is nothing on the sides of the bowl. 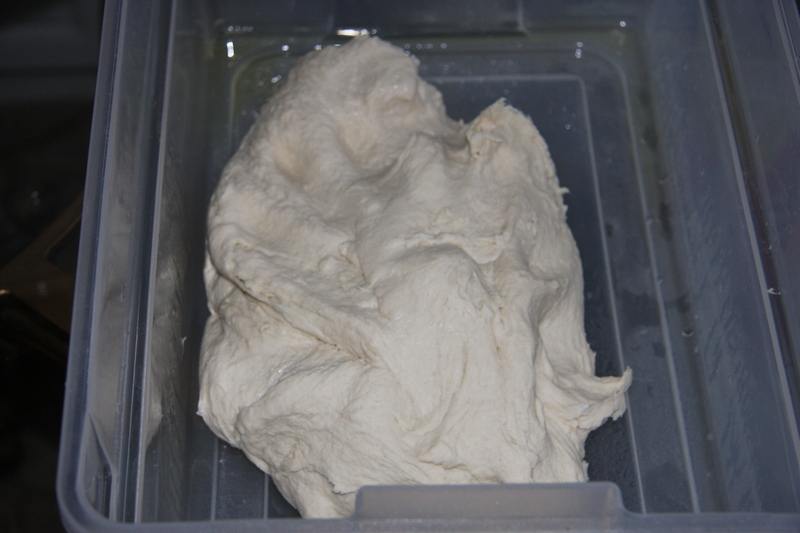 Next place the dough into a greased plastic bowl, place the lid on, but do not seal it. After 2 hours it will have doubled in size. Now you can use it at this point but it is easier to work with if you place it in the fridge overnight with it’s lid, again not sealed. Actually at this point you can store it in the fridge for up to 10 days. On the second day firmly place the lid on it’s container. 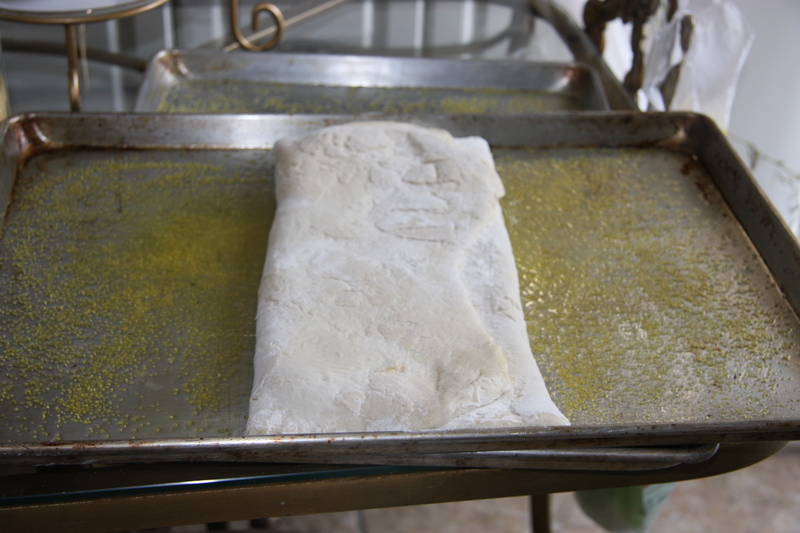 The next day oil your pans and just before you place the rolled dough on them, sprinkle on cornmeal. Depending on the size of pan you choose to use, cut a clump of dough place it on my work surface and sprinkle it with a little flour. Roll it out to the thickness you want and during this process hold the pan above it to see if it is almost the size of the pan. This does not have to be precise at this stage. Sprinkle a little flour on it and proceed to fold it into thirds. So it is easier to place it into the pan. 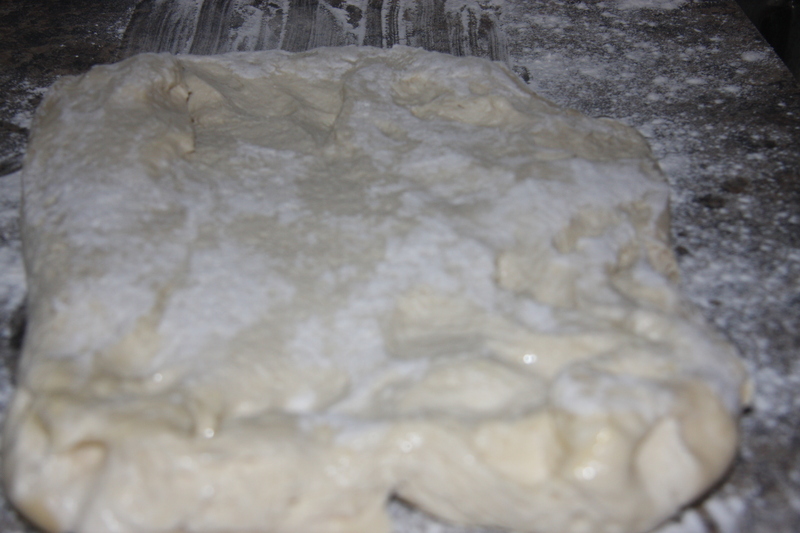 Then unfold it and stretch the dough by pressing it to fit the pan. Continue this process with remaining pans. Next cover the pans with a dishtowel and let the dough rest for 2 hours. The sauce of your choice. I use a passata, which at one time I use to simmer. Now I just place it on the dough straight from the bottle. 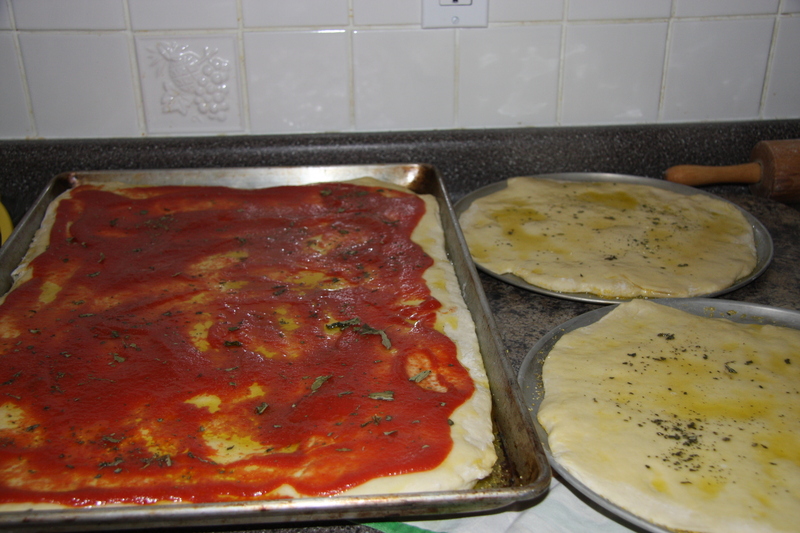 On the right I am making white pizza. Now they have a fancy name for it, foccia. Top with the ingredients you want. Starting first with your grated mozzarella. It starts to turn nice and golden on the bottom. About 12-15 minutes. This is the hardest part of the recipe. Cutting it into pieces and eatting it. Not really. 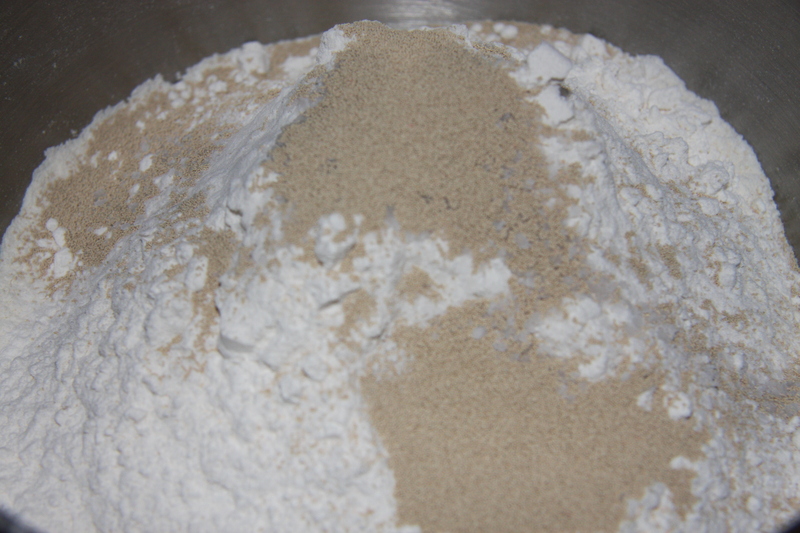 In a mixer bowl mix flour, yeast and salt with the paddle attachment. Change the paddle for the dough hook. Pour in 2 cups of water and start to mix slowly. 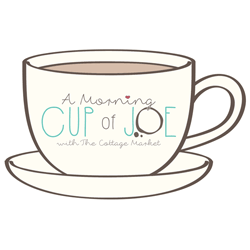 Gradually start to add the next cup of water, watching to see if you need more or less water. 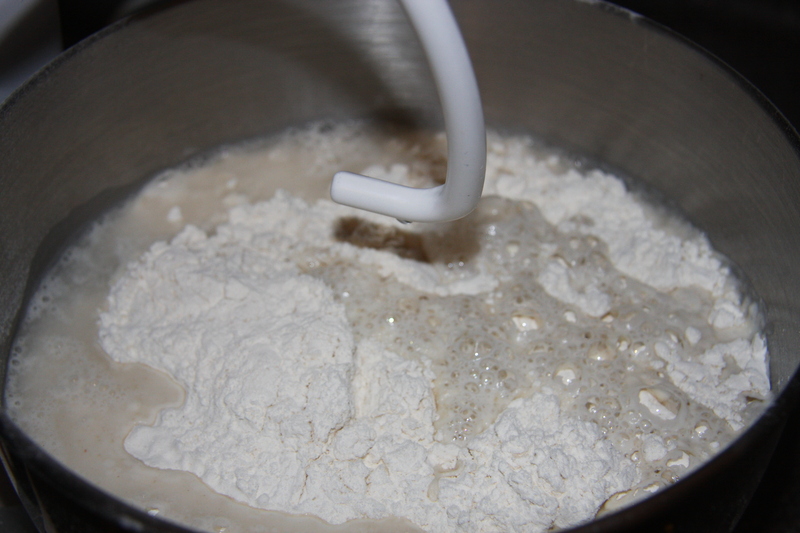 When you are finished adding the water, speed up the mixer to a very fast speed for 5 minutes. 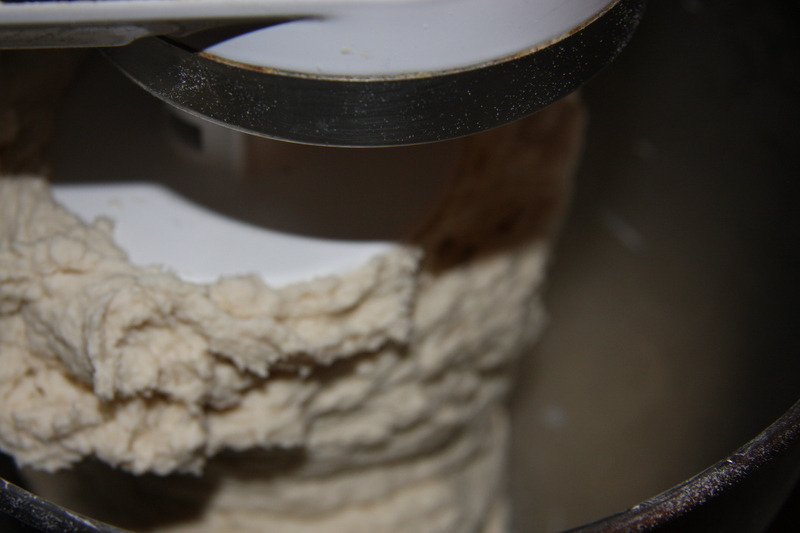 Dough should come away from the bowl. Add this to an oiled container with a lid for 2 hours at room temperature. Refrigerate overnight. 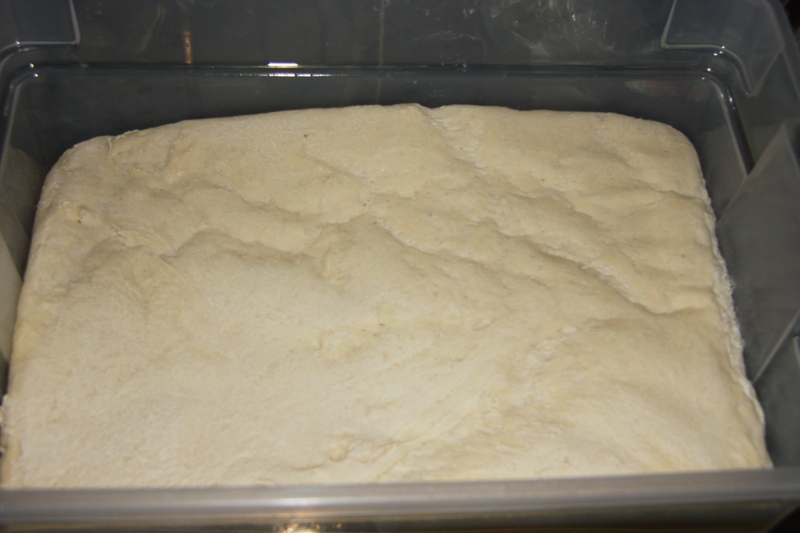 At this point you can leave the dough in the fridge for 10 days sealing the lid firmly the second day. 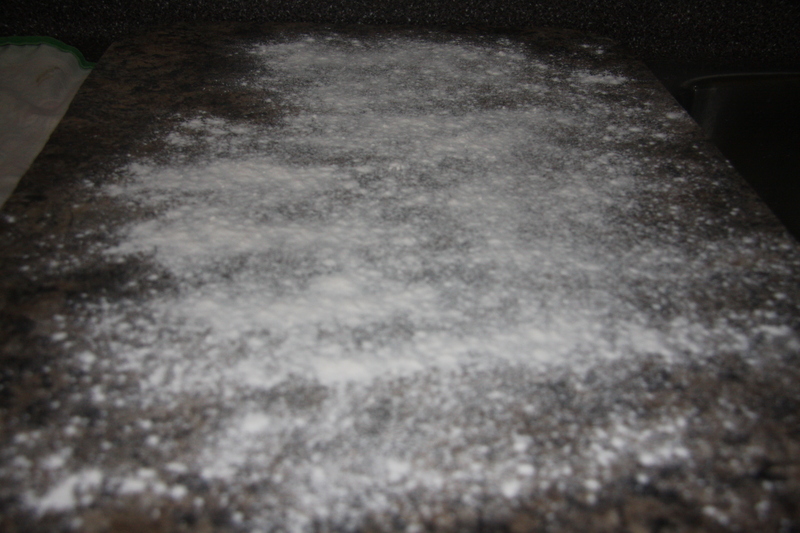 Flour a work surface and break off a piece of dough that will depend on the size of your pan. My large pan is approximately 21 1/2″ x 15 1/2″. I take 3/4 of the dough for that pan. 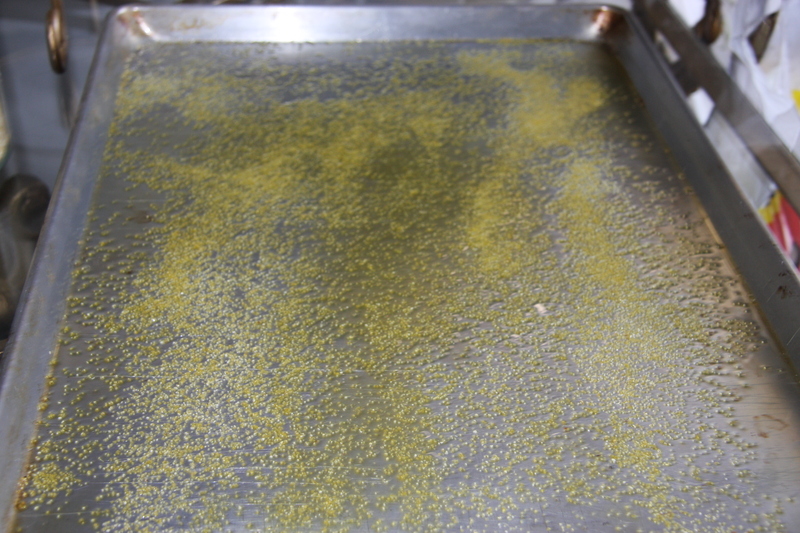 The bit that’s left I divide up between two 12″ round pans. 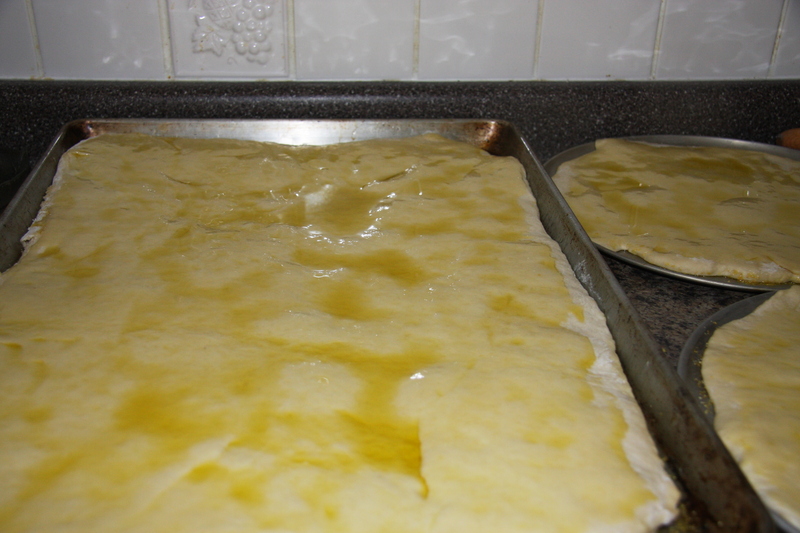 Roll the dough out to approximately fit the pans, which have been oiled and sprinkled with cornmeal. 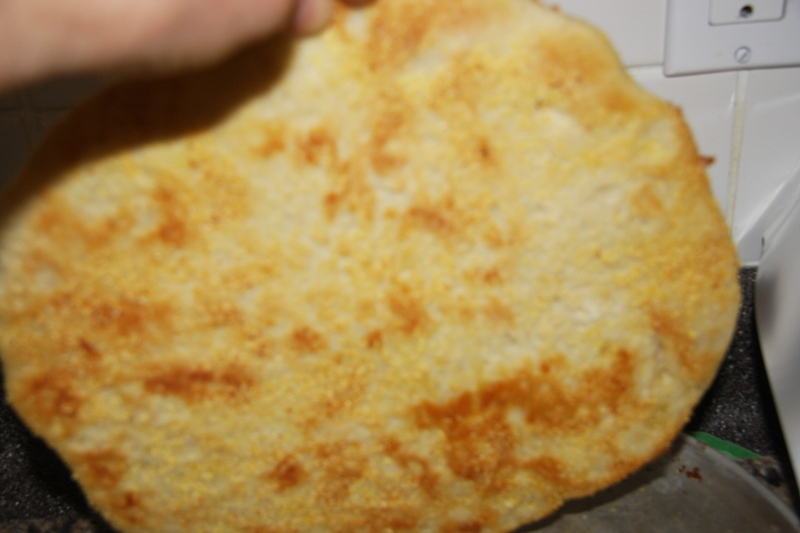 When done sprinkle the dough with a little flour, fold into thirds and place onto pans. 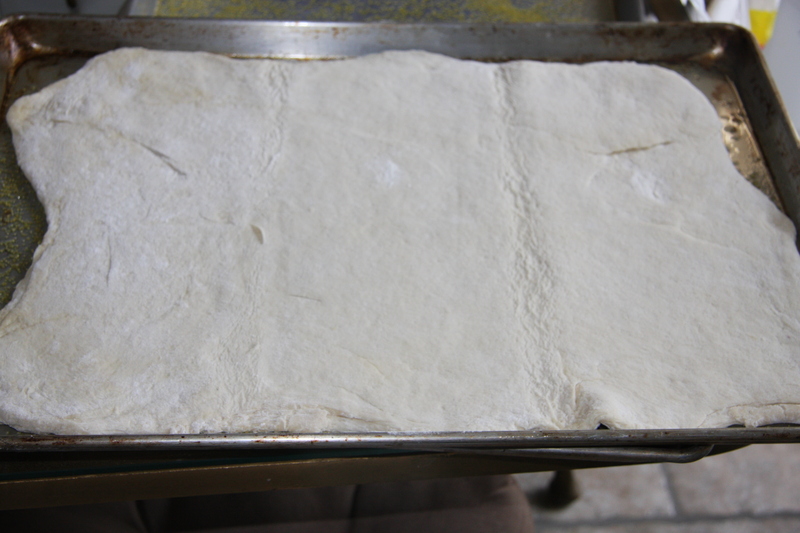 Unfold and by hand stretch the dough to fit the pans. 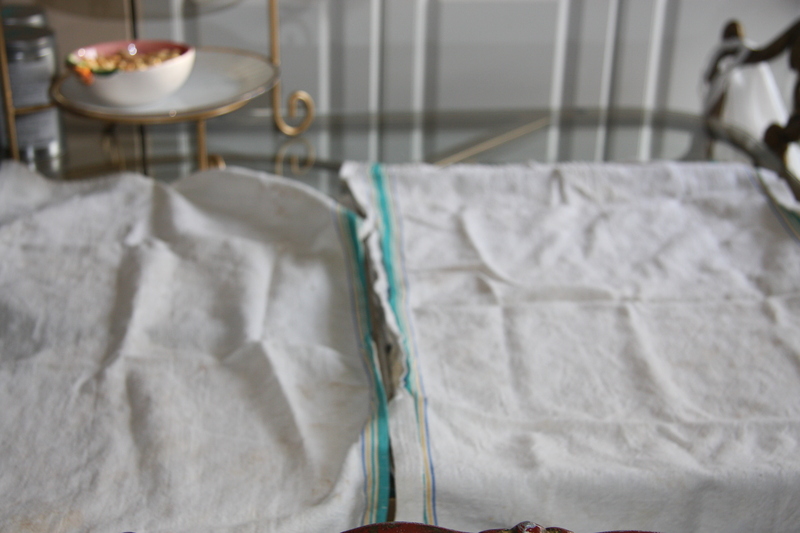 Cover with dish towels and let sit at room temperature for 2 hours. 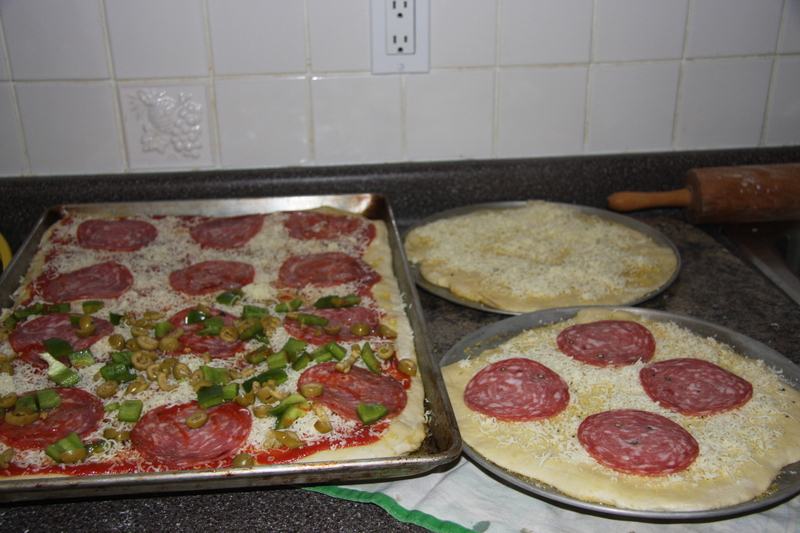 Uncover and spread dough with olive oil, sauce of your choice, shredded mozzarella cheese and toppings of your choice. For example. Nutella topped cheese and mini marshmallows for a dessert pizza, really, it is good. 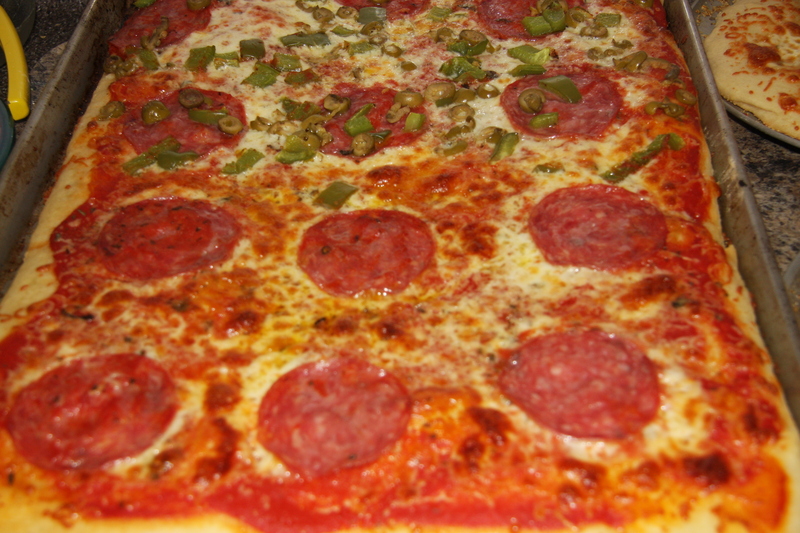 Or the classics, salami, pepperoni, peppers, prosciutto, mushrooms, plain with just sauce and basil (Margarita) or even a mixture of fish that usually comes pickled in a jar, (fruita a mare). Seriously, it is good. I buy it at Costco. Pizza made with or without sauce is good. There is only one way I don’t like pizza, with pineapple. Otherwise bring it on. Hope you do try it. I am will be over in 5, so yummy. To bad, I am busy , I would gladly come to try it.